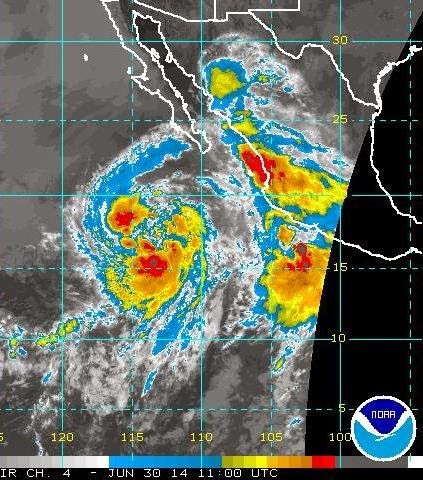 Tropical Storm Douglas is located southwest of the end of Baja, while another storm, Elida, is developing to the east just off of Mexico. 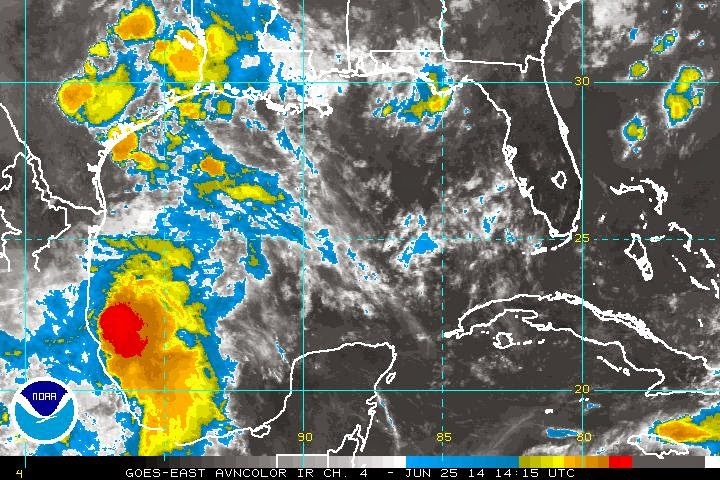 The IR satellite image (below) shows both systems this morning (Monday, June 30th) as well as MCS activity along east side of GoC extending about half way up the Gulf. MIMIC PW analysis this morning (from CIMSS at Univerity of Wisconsin - above) indicates deep, mT air also extends about half way up GoC. The MCS near the far south end of Sonora was most intense around 04 UTC last evening as per image below. This morning's early WRF-NAM forecasts indicate that the weather situation over southeast Arizona will be quite complicated by Wednesday afternoon - forecast of PW below on 5.4 km grid is valid at 5 pm Wednesday. The forecast indicates moisture converging on eastern Pima County from both the southwest and also from the east. Moisture values still not really high but much better than recently. Note the complicating factor introduced by strong, downslope easterly winds blowing in from New Mexico. Somewhat of a miscellany this morning. Sunrise was very hazy with nice orange-to-yellow colors. The Rincons were visible but the Santa Ritas were totally obscured to the south. The reduced visibility seems to be due to both an increase in PW and also smoke drifting southwestward from wildfires off to our far northeast. 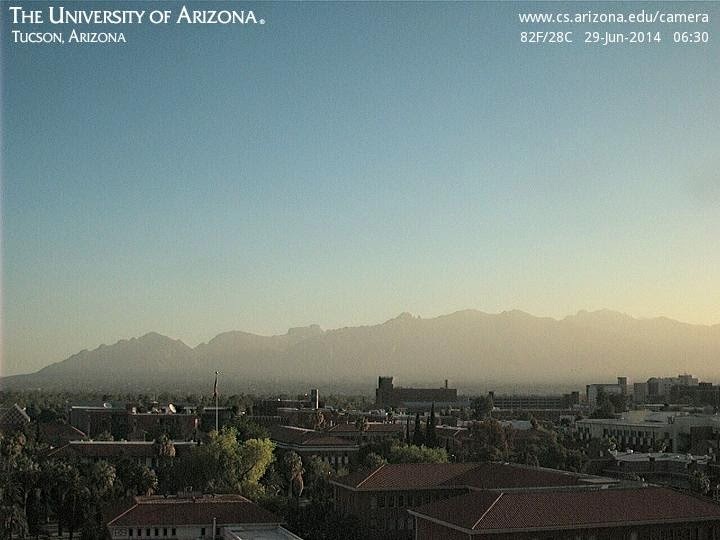 View above is looking north from campus at 6:30 am MST. Far to the south TD East-4 appears very robust in satellite images this morning, and I suspect that NHC will shortly upgrade this system to TS Douglas. 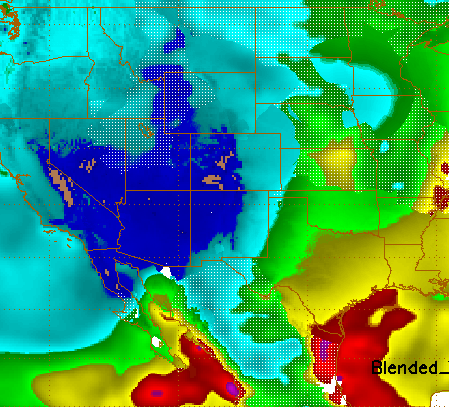 Graphic above shows 12 UTC PW blended analysis from CIRA at Colorado State University. Two small blobs of PW greater than 1 inch have sneaked north of the border, while the very deep mT moisture is inching northward up the lower GoC. The morning NWS sounding, taken from their office on campus, indicates just over an inch of PW with some elevated CAPE present above 500 mb. 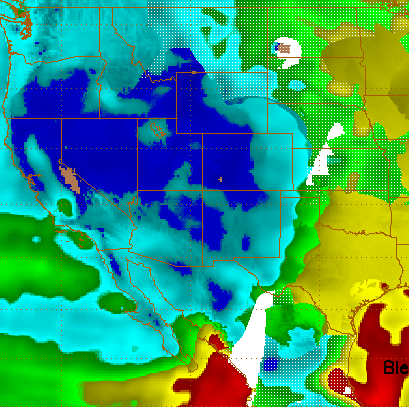 The WRF-NAM forecast of PW (below, on the 5.4 km grid) is from the midnight run and is valid at 6 am MST this morning - excellent agreement with the CIRA analysis north of 25 N.
Finally, above shows the WRF-NAM forecast of PW valid at 11 pm MST on 1 July - next Tuesday night. The model is forecasting a significant surge of low-level moisture up the GoC by that time, with a very strong moisture gradient approaching the border. As I looked at the details of the WRF forecast, I couldn't determine what had triggered this surge. So I looked at the 00 UTC run of the NAM and found that the model was forecasting the tropical system that will trail TS Douglas to be located just southwest of Baja. This feature was forcing the Gulf Surge - will things evolve that way? We'll have to keep a close watch to the south next couple of days. The NHC has upgraded the tropical low near 15N 105W to be tropical depression Four-E. Above is 1730 UTC IR image of Four-E and below is the current NHC forecast for Four-E. Note that NHC forecast is very close to the ECMWF forecasts for this system. If/when Four-E strengthens to a storm it will be Tropical Storm Douglas. First, the trough that has pushed across the Great Basin brought strong enough, west-northwest winds to Arizona and northwestern Mexico to push very deep moisture southward. The above analysis (CIRA blended PW for 12 UTC) this morning indicates that deep, mT air has retreated all the way to the south end of the GoC. Across most of Arizona PW values are hoovering around 3/4 of an inch. The trough has also brought very warm temperatures to middle-levels over all of the Southwest, where current 500 mb temperatures range from -2C to -4C - ugh. The NWS GFS ensembles currently are forecasting about any answer to how this system will evolve that any one could ask for. The operational member forecast (above valid same time as the ECMWF) is very similar to the European model's operational forecast. However, some of the GFS ensemble members (as per the forecast below for 00 UTC July 4) forecast a hurricane to develop and move close enough to the southern half of Baja to trigger a strong Gulf Surge event, one that would likely bring much increased low-level moisture into Arizona. We will just have to watch how the situation evolves early next week to get a feel for what weather we'll experience over the coming holiday weekend. He has summer plots for a number of stations and some sites have plots for each summer going back to 1950. He has used the NWS "monsoon season" definition for these plots - so there can be effects in the data from late season westerly troughs and the data at the ends of the summers are sometimes from after monsoon flow regimes had ended. Regardless, the character of each sites' summer is shown on these graphics in considerable detail (explanations of the plots are at Mike's site). El Paso - wetter than normal especially late in season; Douglas - wettest ever, especially early season; Tombstone - near normal; Tucson - very dry season that ended very early; and Organ Pipe NM - very wet and early season. So these charts demonstrate very graphically how much variance there can be for a "monosoon season" when viewed from a regional (read mesoscale) perspective. These sites are not very far apart, except perhaps for El Paso way over to the east. Since the summer rainfall is produced by thunderstorms, and sometimes by organized thunderstorm, mesoscale systems, what happens at some spots can be totally unrepresentative of what happens elsewhere, even sometimes at a nearby site. There is large MCS over the GoM this morning - see IR image above from 1415 UTC. The CG flash detections (below for 12-hours ending at 6 am MST) indicate that the convective cores of the MCS have been moving rapidly north-northwestward up the coast, while a huge upper-level cloud shield trails off to the south. Currently winds in the middle and upper troposphere are predominantly westerly, with the subtropical easterlies displaced far to the south. The 1200 UTC analyses and data plots from University of Wyoming upper-air page are shown above and below for 250 and 500 mb. However, the ECMWF forecasts shift the easterlies rapidly northward beginning late week. By 168 hours - 12 UTC on 1 July - the 500 mb subtropical anticyclone (above) has shifted northward in the forecasts and its axis is forecast to be as far north as near the Four Corners. The 850 (top below) and 700 mb (bottom) forecasts valid at the same time indicate low-level moisture heading northward as a tropical storm approaches the south end of Baja. I can almost smell the air after the first thunderstorm here. The precipitable water (PW) has been bouncing around some today - Tuesday, June 24th. The CIRA blended PW analysis for 19 UTC this afternoon (above) indicates that dry, midlatitude air from the Pacific dominates over most of the West and Southwest U.S. However, subtropical, mT air dominates over much of western Mexico. The GPS time series below indicate PW varying substantially on campus and also out at the community college in Sells (where values have dropped to as little as 1/10 inch at both sites). Unfortunately, the site at Douglas (closest to the airmass over Mexico) appears to be out-of-service. 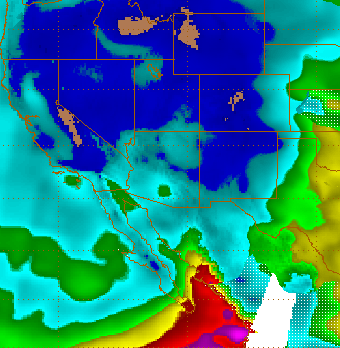 The graphic below is this morning's forecast of PW from the WRF-GPS at Atmo and it looks pretty good for Arizona. However, model forecast appears a bit too dry over northern Mexico, parts of the Texas Big Bend, and parts of New Mexico, where some thunderstorms have developed. Am obviously running late today. 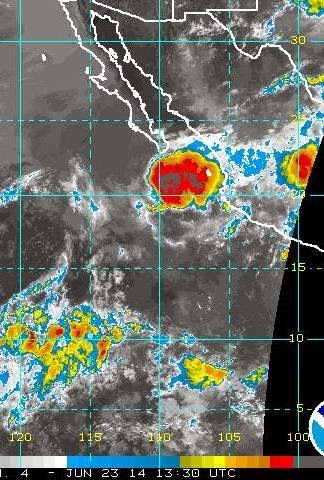 Yesterday - Monday June 23rd - was a fairly active storm day in northern Mexico. Graphic above shows detected CG lightning flashes for the 12-hours ending at midnight last night. IR satellite image below is from 2315 UTC yesterday afternoon. Note that westerly flow prevails in middle and upper troposphere, so storms were moving east-southeastward and anvils (except in far southeast corner of IR image) were spewing out toward the east. 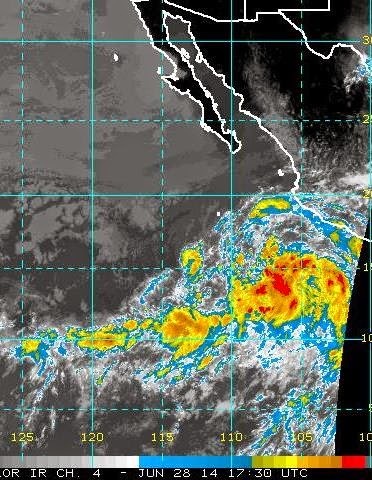 A tropical low pressure system has moved northward the past several days and is now south of the tip of Baja. This system has a large area of strong convection associated with it this morning - see IR image above from 1330 UTC (6:30 am MST). Such systems and large MCS events over the GoC can trigger strong surges of low-level moisture up the GoC - so that's the first thought I had when I saw this image. The blended PW analysis (below for 1300 UTC) from CIRA at Colorado State University indicates that PW values of over an inch extend northward up the GoC for about 2/3rds of its length and the same is true for the western mountain slopes of Sonora. 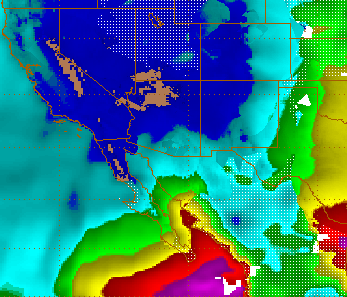 PW values of a half to near an inch cover most of the Sonora/Arizona borderlands. I have taken a look at today's early run of the WRF-NAM model from Atmo with an eye toward the model's forecast of the evolution of the PW field through mid-week. This is best done with the 5.4 km grid version of the model - as shown above valid at 7 am MST tomorrow morning (June 24th) and below valid at 11 pm MST on June 25th. The forecasts indicate a serious battle between the very dry air that covers most of the forecast domain and the very moist, mT air trying to move northward. The forecasts indicate that the dry air prevails for the next several days over most of Arizona, but with pushes of moisture making it into Cochise County at times. The model continues to forecast some thunderstorms over there, but with limited coverage. Once the week is over we'll be approaching the first week in July and will watch to see if the Pacific anticyclone weakens and shifts a bit westward to give the mT air a chance to move further north. I was viewing a NASA image of the U.S. at night (above) and noticed that there appeared to be a large metropolitan area out in western North Dakota. So I googled a query about are the Dakota oilfields lit up at night. 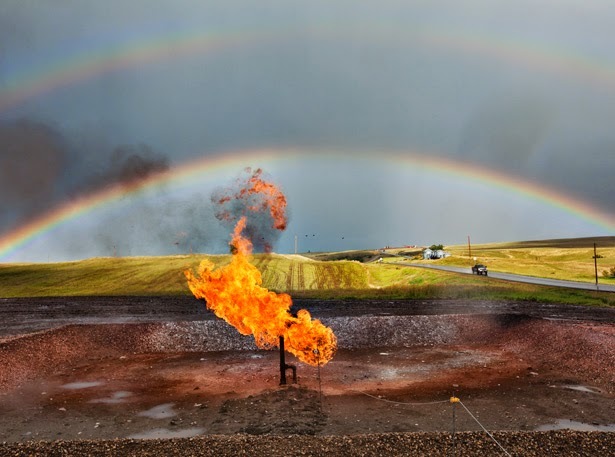 I quickly discovered that there were numerous links about how bright the fields are; how much gas is being "flared off"; the amounts of energy being wasted; not to mention heat and CO2 directly input into the atmosphere. Examples below, as well as a brief blurb from one of the links about this phantom megalopolis. There was short-lived MCS near the southern end of the GoC last eveing (Thursday, June 19th) - IR satellite image above is from 0215 UTC on the 20th (7:15 pm MST). Cloud top temperatures were quite cold and this system is certainly a harbinger of things to come. The following are from Art Douglas and also from NOAA's Climate Prediction Center (CPC). The above are from the CPC showing forecasts from the fully-coupled, global CFSv2 numerical forecast model. The forecasts are for monthly rainfall anomalies during July, August, and September 2014. The model forecasts each of these months to to be wetter than normal over most of the Southwest and also over northwest Mexico. These numerical forecasts are what led to the headline we saw on the front page of last Saturday's (June 14th) Arizona Daily Star - "Dig umbrella out of closet - monsoon could be a wet one." Below are outlooks from Art for the same months. These are based on Art's analog identification procedures and his years identified as analogs are indicated. Art's outlook indicates a drier than normal summer for most of the Southwest, although there is some recovery during August. So different procedures and different models produce widely varying forecasts. Here in southern Arizona El Nino summers tend to be near normal or dry. El Nino July's tend to be quite dry but an August rebound can sometimes bring the summer rainfall back to near normal. I tend to consider September a "wild card" month, since there are so many features in play - how long does the summer pattern continue into the month; how do middle-level, westerly short-waves interact with residual subtropical moisture in low-levels (so called "transition events"); do westerly short-waves pick up decaying tropical storms and bring significant rains into the Southwest? So, it's a complicated mess - especially since across southern Arizona several heavy thunderstorms hitting the same measurement site can determine the character of a month or even of the season's rainfall. 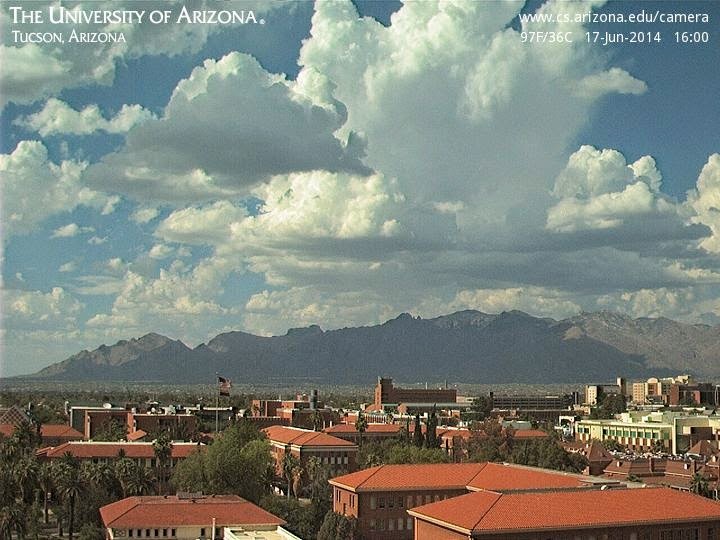 There was considerably more thunderstorm activity over southeastern Arizona yesterday than model forecasts had indicated. Above view shows buildups over the Catalinas at 4 pm on June 17th and graphic below shows detected CG flashes through midnight last night. There were CGs over the Metro area and both TUS and DM observed thunder at the stations. Rainfall was light to none at lower elevations in eastern Pima County. However, 7 ALERT stations in the Catalinas and Redington Pass areas measured rainfall with 4 sites reporting 1/4 inch or a bit more. Conditions today are somewhat similar, but warmer air is present in middle-levels, which should decrease the chances for storms, especially at low elevations. How did Those 10-Day Forecasts Do?